What is it about underpants? I’ve been reluctant to admit that I am raising a reluctant reader. At two months old, my kid was bapping the pages of board books to turn them faster than I could read. Look at that, I thought smugly… So clever! As a kindergartener, he would follow along when his older sister poured over early readers, and blurt out words if she stopped to sound them out. I’d look over at my husband and arch my eyebrows as if to say, Pretty good, eh? As he advanced in grades, reading remained a strength. I thought that “getting my boy to read” was one of those battles I wouldn’t have to fight. I made the mistake of assuming that because he was able to read, he would want to read whatever I got for him from the library, book store, community book sale, you name it. So many great books! Hey, MANIAC MAGEE by Jerry Spinelli, he’ll love that! 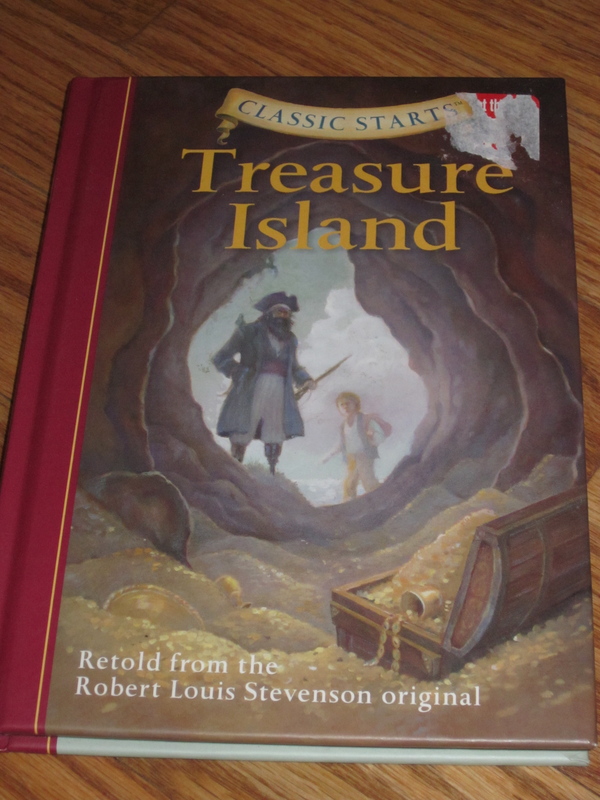 Oooh…TREASURE ISLAND, what boy could resist? But time and again, my son would look at the cover of a book, read the first paragraph, then shrug his shoulders and pass the book back to me, saying, “no thanks.” The latest blow came after I’d made a special trip to a fantastic indie bookstore. Carefully, I selected Gary Paulsen’s HATCHET. Cool title. Invokes violence. He’ll bite. 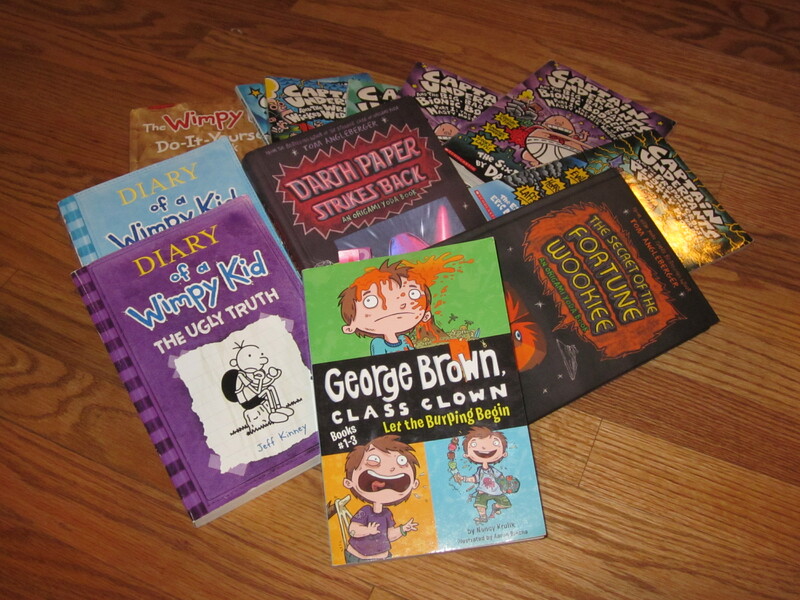 A week after that I was at a big box store and saw a stout volume of the first three books (Super Burp, Trouble Magnet, and World’s Worst Wedgie) in the George Brown, Class Clown series by Nancy Krulik. Nearby was book #7 in the series: the picture on the front was of a boy in underpants, of the tighty-whitey variety. My son had loved that other famous Captain of the unmentionables, so I sighed and put the collection of the first three stories in my loaded cart. It just wasn’t what I would pick. I hadn’t even realized I how harshly I was judging the underpants, diaries, and other graphic novels he gravitated to. There is a place for stories that simply seek to be silly and fun. And apparently one of those places is on my son’s nightstand. I had to just get over myself and my vision of what were the right books. The right book, it turns out, is any one that makes a kid run up to his room after school so he can get back to the story. 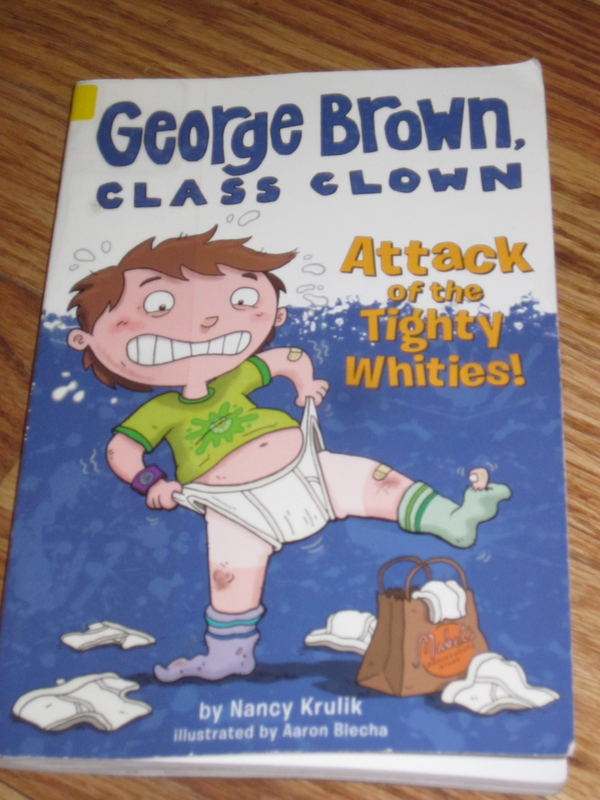 1) George Brown, Class Clown (Series by Nancy Krulik) “Mom, did you know a lady wrote this?” Yes, and I thank her! 3) Diary of a Wimpy Kid (Series by Jeff Kinney) The “Do-It-Yourself” books in this series have the added benefit of encouraging creative writing. 5) The Strange Case of Origami Yoda, Darth Paper Strikes Back, and The Secret of the Fortune Wookie, all by Tom Angleberger. Bonus side effect of son taking an interest in origami. (At least when the end result is a Star Wars character). There are many other fantastic graphic novels out there that are kid favorites. If you have suggestions that have worked for the reluctant reader in your life, I’d love to hear them! Nancy Tandon • This entry was posted in Chapter Books, Middle Grade Fiction, Reading, Reluctant Readers and tagged books, graphic novels, high interest books. Bookmark the permalink. My boy is a voracious Captain Underpants fan (and I can’t help but agree with him, the plots are marvelous). Fortunately, his interest is not all underpants-based. 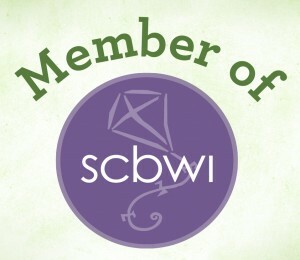 Alex also loves Ivy & Bean and the Magic Tree House series, among other things. Does that make him sort of a Renaissance man?